Eve Wylden is the best actress in one of my favourite Toronto theatre companies, The Red Light District. The chameleonic actress was a highlight of the RLD’s innovative production of The Witch of Edmonton in the Summerworks festival, but it was her off-kilter performance as the doctor in Ted Witzel’s circus-themed production of Woyzeck that earned her a Best Actress nomination in the Local/Independent division of the 2010 My Theatre Awards. The first show that I remember seeing was The Phantom of the Opera. I was madly in love with Colm Wilkinson for most of my childhood. I went to see him like 3 times then I wrote an English essay in grade 5 on Colm Wilkinson. I really loved that show. When I was little I had aspirations to sing. So I was inclined towards musicals at the time, I didn’t know better. And The Wizard of Oz was kind of my favourite movie when I was a kid and I think that’s, in a way, what made me want to be an actor. What moved you out of your musical phase? As I got older and started going to more theatre, and studying theatre, I lost my taste for musicals. I still do go see some musicals but it’s definitely the last thing on my list. I don’t know, I don’t have favourites. That’s a general rule: I don’t have favourite actors, I don’t have favourite plays. It’s very fleeting, I’m a circle person. So, when I was little: Judy Garland and Colm Wilkinson, let’s start there. Then I guess it was just whomever was my most recent find. I’ve lately been shying away from big stages, not to say that I’ve ever performed on a big stage. But even seeing shows on big stages, it forces the actors to be bigger, which I don’t like. So I like smaller spaces, the more intimate venues… Site-specific is a new trend in theatre right now but it is a lot more interesting I think. But just in general, smaller spaces like The Theatre Centre or Passe Muraille vs. something like Canstage or Stratford or something. I did a couple summer programs: one at RADA (the Royal Academy of Dramatic Arts in England) and with the American Academy in New York. Then I did a year at the no-longer-existing Academy Drama School in London. Then I went to U of T and got my BA in theatre. What I love about working with Ted [Witzel, artistic director of the Red Light District] is that he tends to cast me against type. There are no dream roles because I think that the script is a blueprint. When I read a script it’s so far away from being a play in my mind and the role could be anything depending on the concept and who the collaborators are. Ted is definitely one of them. He’s also a wonderful and lovely friend. I love working with Ted, I work with him every year. 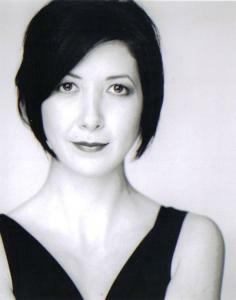 Also Johanna Schall who guest directed for us for The Misanthrope, it was wonderful to work with her. I really like Germans… so Ted (who’s currently in Germany) and a lot of Germans. For sure Miss Toronto [Gets a Life_in Parkdale] was a big thing for me because that was the first show I helped to create from scratch. So that was a really different experience but also very scary and wonderful when people liked it. Woyzeck was for sure fun, and a large part of that was learning to walk on stilts. The first show I did with Ted, actually, Titus still stands out in my mind. The show had many flaws, it was the first Red Light production, but I look back on it with very fond memories. How did you get involved with Red Light District? I wasn’t in the same year as Ted at school but I knew his face. He was having auditions for Titus and I didn’t audition because the time when the show was originally going to go up I wasn’t going to be in Toronto. But then when the show date got moved it worked out. I’ve been with them ever since. How is the RLD different from other theatre companies? I don’t want to use key words like “experimental”… What I like is that we do classical works and re-imagine them in a way that’s actually relevant to people right now. Which means that we’re not trying to do what a lot of people do with classical work, which is to modernize it, just transplant it to a modern time period. Say “let’s do Twelfth Night set in the 1920s” why? For no apparent reason, just because it’d be fun to wear flapper costumes. I think that the Red Light District focuses more on the “why” and how to make these works accessible to people today. Because they are so relevant and sometimes it’s just the language or the idea of “classical”-ness that makes people shy away. Describe the rehearsal process for Woyzeck. Ted comes in with a concept, he has a pretty strong idea of where he wants to go. That being said, however, he’s amazing at really listening to all the actors and our ideas and it really ends up being a collaborative process. He’s very open, in the rehearsal space, to any new information that comes out of any one of us. We also focused a lot on the dance and movement in this one; Brian Solomon was the choreographer. So that made the Woyzeck experience different from any other. The physicality of it, and the circus elements- the training we had to do for those things. Tell me about the doctor. How did you approach the role? Did you do anything specific to prepare? No. I didn’t do anything specific to prepare other than learn how to walk on stilts….How do I prepare? I read the script a lot. I mostly just think about it a lot. It’s one of those things where if I just let my mind stew a little bit, questions will come up or ideas will arise and I can go from there. But mostly I just do the work in the rehearsal space. How did the circus aesthetic/tone affect your performance or interpretation of the character? I don’t think you can say it affected it, I think you have to say that it was intrinsically connected to it. We all had sort of duel characters. I was the doctor but I was also some sort of ringmaster in the circus world. So the difficulty I had was knowing where the differences were and where were the points where they overlap or not. So the ringmaster was more connected to the circus itself, obviously, and the doctor, while having elements of circusness- that’s not a word, circality?- he wasn’t in the circus proper. STILTS! It was really fun and it was really nice to make a little “woo” from the audience. Especially the people that know me and know I can’t walk on stilts, because I couldn’t. There was another moment in the beginning of the show (thank god it was near the beginning or I wouldn’t have been able to concentrate until it was over), I had to do a handspring onto another actor. It was such a brief moment, no one else probably cared at all, but I was like “aww, I have to do this” so I did a handstand and then flipped onto this person’s shoulders and then stood up. That was a really big thing for me because I don’t like doing handstands. I chickened out a few times, not in performance but in rehearsals when I was like “uhahhh, no”. Stilts and handsprings. See question above. The physical challenges were probably the biggest things. For all of us, we’re not dancers and there was quite a bit of dance and gymnastic work in the show. So that was probably the biggest challenge. The other challenges were just asking the questions and always having the debates about what is real vs. what’s been imagined in Woyzeck’s mind. What is a manifestation of his delusional state vs. what would be objectively real to someone else. Tell me about The Witch of Edmonton. How was that experience? That was a lot of fun. We threw that show together in no time. It was great. To be honest we had very little rehearsal time. The rehearsal time we did have we weren’t able to really rehearse at 100% because the park is always full of people. Sometimes there would be people where we needed to be and dogs and dog poo and lots and lots of stuff that was preventing us from going full out like we would have in a neutral space. What about the shows, that stuff was all still there wasn’t it? Less so at night, and also we had a permit for the shows so we could actually, if someone else wanted to do something like have a football tournament, we could be like “no, you can’t, we have a show”. So that made it logistically easier. I don’t think I can divulge the details of our upcoming season because they haven’t been officially announced. I don’t want to get in trouble but we do have a full season planned for this year. It’s the first time that we have a full season consisting of shows that are connected. I think our first show is in May and through November we’re trying to do 4 shows. So that’s what’s happening theatre-wise with me. I’m also looking into trying to do a remount of Miss Toronto. But it’s always difficult, being in a show and self-producing, it’s too much weight on my shoulders. So we’ll see if someone wants to help us with that.